In GOP Debate, Candidates Vie For Valuable Commodity: Camera Time : It's All Politics If you tuned into the CBS/National Journal debate Saturday night hoping for a reprise of the drama created earlier in the week by Texas Gov. Rick Perry's now-legendary "oops" gaffe, you were destined for disappointment. Republican presidential candidates jockeyed for airtime when they met for their first prime time TV debate on Saturday night in South Carolina. If you tuned into the CBS/National Journal debate Saturday night hoping for a reprise of the drama created earlier in the week by Texas Gov. Rick Perry's now-legendary "oops" gaffe, you were destined for disappointment. With the latest polling now showing a three-way race between former Massachusetts Gov. Mitt Romney, businessman Herman Cain and former House Speaker Newt Gingrich, the debate moderators gave Gingrich more air-time than he'd gotten in most previous debates. In this campaign, dramatic surges in polling and fundraising have seemed to follow from solid debate performances — a phenomenon that at times benefitted Rep. Michele Bachmann and Cain but damaged Perry. 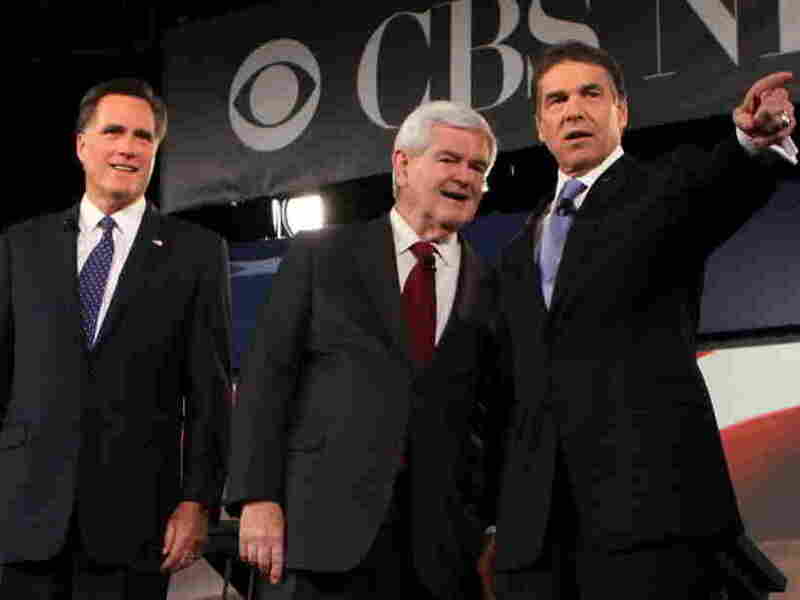 So for Gingrich, Saturday night's debate was an opportunity to build on his recent momentum. He used his airtime to aim for an elder statesman role, passing up a chance to attack Romney in person, as he'd done the day before on a talk radio show. But it's questionable how many voters got a chance to see Gingrich's big moment in the spotlight. Although this was the first GOP primary debate broadcast on a major network in prime time, it occurred on a Saturday night, when many people probably have better things to do. And CBS made the decision to air only the first hour of the debate on most of its affiliates. The final half-hour was relegated to a livestream on its website. Yet that idea wasn't ready for prime time itself: The feed was marred by sound problems that rendered it almost unintelligible. Comments on Twitter were merciless: "CBS is going to ask Dan Rather to do a dramatic reading of debate transcript (maybe perform interpretative dance)," tweeted @rkellusturner. "CBS will release a transcript of the debate on a 1972 Olivetti typewriter," tweeted @jpodhoretz. While Gingrich got more camera time in this debate, candidates who got less were vocal in complaining about it. The daughters of former Utah Gov. Jon Huntsman — clearly hoping for his own surge in the polls — groused on Twitter that "CBS must know that our dad is the only one in the room that can beat Obama. Shunning the adult in the room." And Michele Bachmann posted an email to her Facebook page from CBS' new political director John Dickerson that seemed to suggest that the network did not plan to ask Bachmann many questions in the debate. Bachmann's campaign manager told her Facebook followers this was proof that "the liberal mainstream media elites are manipulating the Republican debates by purposely suppressing our conservative message and limiting Michele's questions." But, as Ben Smith at Politico later tweeted, Dickerson and CBS pointed out that Bachmann remains at 4 percent in the polls. Without that all-valuable camera time, though, that's a dynamic that could be difficult for her to change.